As Christmas parties go, the one hosted by the University of the Fraser Valley women’s soccer team last Saturday was somewhat unconventional. Instead of gathering in front of a crackling fire and exchanging Secret Santa gifts while sporting cheesy-but-amazing holiday sweaters, the Cascades chose to spend the evening at Ruth & Naomi’s Mission in Chilliwack, preparing a meal for people in need. 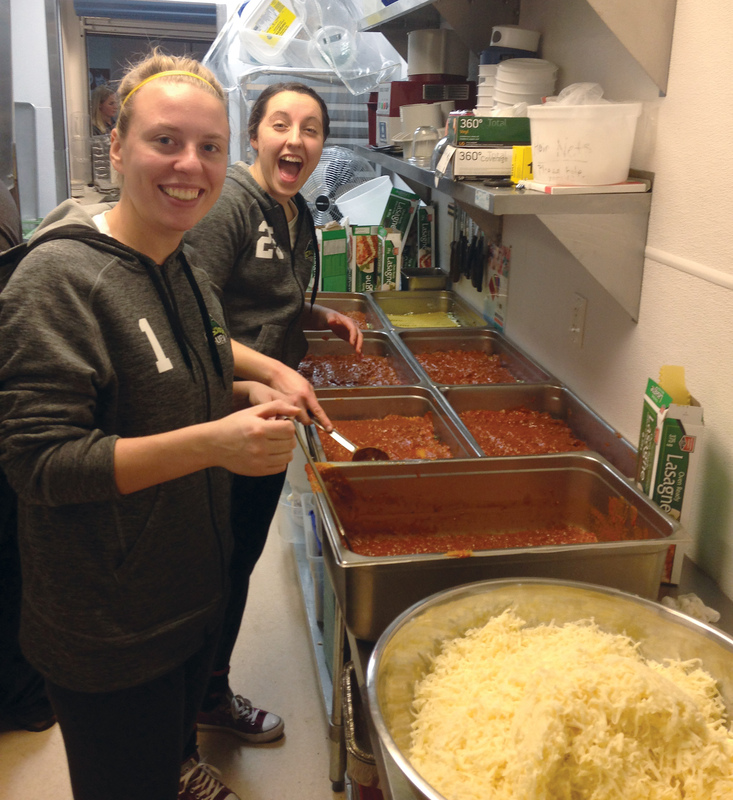 Goalkeepers Kayla Klim (left) and Risa Venuto had fun preparing the meal. In the spirit of the season, the team handled every aspect – from buying the groceries, to preparing the meal, to serving the food, to cleaning up afterward. In the end, about 120 people enjoyed lasagna, Caesar salad and garlic bread courtesy of the Cascades. 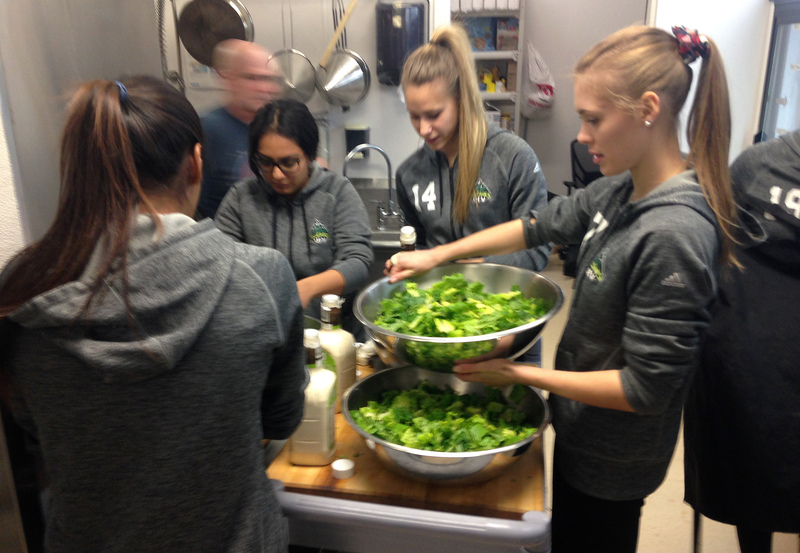 “We did this two years ago, and the girls liked it and wanted to do it again,” said UFV head coach Rob Giesbrecht, whose wife Cheryl works at Ruth & Naomi’s Mission as administrative assistant and volunteer coordinator. “We want to have a culture on our team that we give back. Giesbrecht was proud of how his players spent time at the tables interacting with the people they served. When the meal was over and the cleanup was done, the Cascades spent a few minutes together sipping hot chocolate and handing out player awards for the 2015 season. 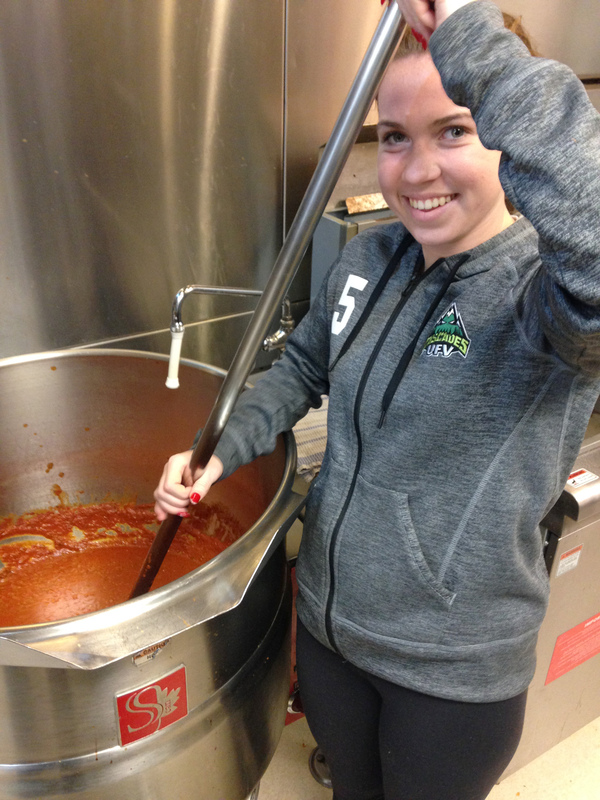 Megan Theroux stirs the meat sauce. “Giving back in any sense just brings people together,” goalkeeper Kayla Klim said, reflecting on the night. “It’s a sense of unity that every successful team should have. I feel like it’s a much more meaningful way for us to spend our time than our typical Christmas gatherings, and that’s maybe what made it so special.